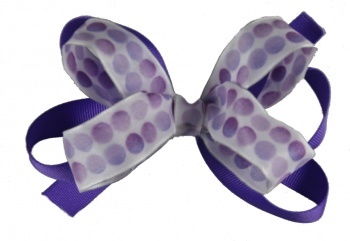 Double layers of purple and white with purple polka dots. What fun this bow will bring to any outfit. The bottom layer is a solid purple grosgrain bow and the top has white with purple dots on a satin ribbon that has wire edges. The wire edges is a neat feature because it allows the bow to get readjusted and fluffed just the way you want it to look, if it happens to get pushed down.